Ethiopia is facing a crisis of unprecedented magnitude, yet its government and Western enablers refuse to acknowledge and recognize the depth of the crisis. The nationwide protest held on Saturday by the Oromo people, the single largest ethnic group both in Ethiopia and the Horn of Africa, is clear evidence of a crisis that is threatening to degenerate into a full-scale social explosion. The protests are the most unprecedented and absolutely extraordinary display of defiance by the Oromo people and it is by far the most significant political developments in the country since the death of Prime Minister Meles Zenawi, the strongman who ruled the country for over two decades. The protests took place in more than 200 towns and villages across Oromia, Ethiopia's largest region, and were attended by hundreds of thousands of people. According to Oromia media Network, security forces used live bullets against peaceful protestors, killing over 100 protestors. Oromos have been staging protest rallies across the country since April of 2014 against systematic marginalization and persecution of ethnic Oromos. The immediate trigger of the protest was a development plan that sought to expand the territorial limits of Ethiopia's capital, Addis Ababa, into neighbouring Oromo villages and towns. Oromos saw the proposed master plan as a blueprint for annexation which would further accelerate the eviction of Oromo farmers from their ancestral lands. When the protest resumed in November of 2015, the government dismissed the protestors as anti-peace elements and accused them of acting in unison with terrorist groups -- a common tactic used by the government to crackdown on dissent and opposition. The government used overwhelming force to crush the protest, killing hundreds of protestors and arresting thousands. In its recent report titled "Such a Brutal Crack Down", Human Rights Watch criticized the "excessive and lethal force" used by security forces against "largely peaceful protestors" and puts the number of deaths at over 400. The figure from the activist group is considerably higher. The Oromo make up well over a third of Ethiopia's 100 million people. Historically, Oromos have been pushed to the margin of the country's political and social life and rendered unworthy of respect and consideration. Oromo culture and language have been banned and their identity stigmatized, becoming invisible and unnoticeable within mainstream perspectives. Oromos saw themselves as parts of no part -- those who belong to the country but have no say in it, those who can speak but whose voices are heard as a noise, not a discourse. When the current government came into power a quarter of a century ago, it pursued a strategy of divide and rule in which the Oromos and Amharas, the two largest ethnic groups in the country, are presented as eternal adversaries. Oromos are blamed as secessionists to justify the continued monitoring, control, and policing of Oromo intellectuals, politicians, artists and activists. By depicting Oromo demands for equal representation and autonomy as extremist and exclusionary, it tried to drive a wedge between them and other ethnic groups, particularly the Amharas. This allowed the ruling Ethiopian People's Revolutionary Democratic Front and Tigrayan elites to present themselves as the only political movement in the country that could provide the stability and continuity sought by regional and global powers with vested interest in the region. In its 2015 comprehensive country report titled "Because I am Oromo", Amnesty International found evidence of systematic and widespread patterns of indiscriminate and disproportionate attack against the Oromo simply because they are Oromos. 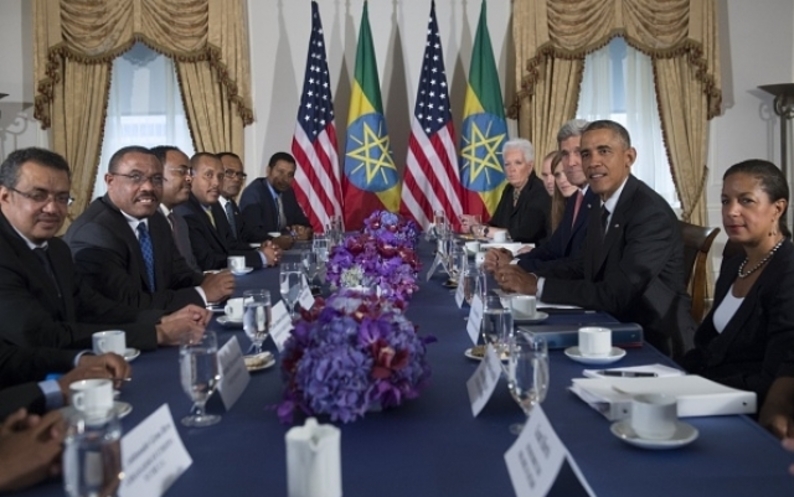 The United States see the Ethiopian government as a critical partner on the Global War on Terror. This led administration officials to go out of their way to create fantasy stories which cast Ethiopia as democratic and its leaders as progressive. In 2012, then US Ambassador to the UN, Susan Rice, described Meles Zenawi, the architect of the current system, as "uncommonly wise" and someone "able to see the big picture and the long game, even when others would allow immediate pressures to overwhelm sound judgment." In 2015, Undersecretary of State for Political Affairs Wendy Sherman praised Ethiopia as "a democracy that is moving forward in an election that we expect to be free, fair, credible, open and inclusive." She further added, ""Every time there is an election, it gets better and better." That election ended with the ruling party winning 100% of the seats in parliament by wiping out the one opposition in the previous parliament. In 2016, President Obama became the first sitting American president to visit Ethiopia amid widespread opposition by human rights groups. Obama doubled down on previous endorsements by administration officials by describing the government as 'democratically-elected." The US led 'war on terror', started by President George Bush, provided the government with a political and legal instrument with which the government justified severe restrictions on freedom of expression, assembly, and association. The 2009 Anti-Terrorism Proclamation, one of the most draconian pieces of anti-terrorism legislations in the world, enabled the government to stretch its power of prosecution and punishment beyond what is permissible under standard criminal and constitutional law rules. Under the pretext of 'fighting terrorism', the regime exiled, prosecuted and convicted several opposition leaders, community leaders, journalists, bloggers, and activists; paralyzing criticisms of any type. In its 2015 report titled Ethiopia's Anti-Terrorism Law: A Tool to Stifle Dissent, the Oakland Institute details the ways in which Ethiopian authorities systematically appropriate the anti-terrorism law to annihilate dissent and opposition to the policies of the ruling party. As of July, the protests have been spreading into the Amhara region, home to the second largest ethnic group in the country. The Amharas and Oromos, which constitute well over two-third of the country's population, are seen as 'historical antagonists'. The ruling party transformed this antagonism between the two ethnic groups into a productive political tool. According to the governing narrative, Oromos are narrow-minded and exclusionary people who seek to disintegrate Ethiopia into smaller republics while Amharas are chauvinists who seek to restore the old feudal order, leaving the ruling party as the only political force that can rescue Ethiopia from both threats. These governing narratives are being exposed as the two groups begun to see how these narratives were crafted and are expressing solidarity towards each other as victims of the same system. The Ethiopian government is in denial and making the same promises of restoring 'law and order' through further repression and crackdown. However, this can only exacerbate the situation and throws the country into chaos in an already volatile region. Awol K. Allo is LSE Fellow in Human Rights at the Centre for the Study of Human Rights. He writes on the issues behind several months of protests by Ethiopia's largest ethnic group, the Oromos. Around 100 people died following clashes with security forces and demonstrators at the weekend, according to Amnesty International.